BOCA RATON, FL (May 20, 2013) – Demonstrating its long-standing “Community for Community” commitment, Broken Sound Club, an award winning 5-Star Platinum Club of America, sponsored the construction of Habitat for Humanity’s most recent South Palm Beach County home with donations of $50,000 and more than 200 volunteer hours from staff members. The keys to the home were presented by Habitat For Humanity leadership and Broken Sound Club members and staff to new homeowner Rhonda Jenkins with her daughter Rashema and granddaughter Kei’jah alongside her at a dedication ceremony yesterday at the new house located at 126 Ocean Breeze Circle in Boynton Beach. 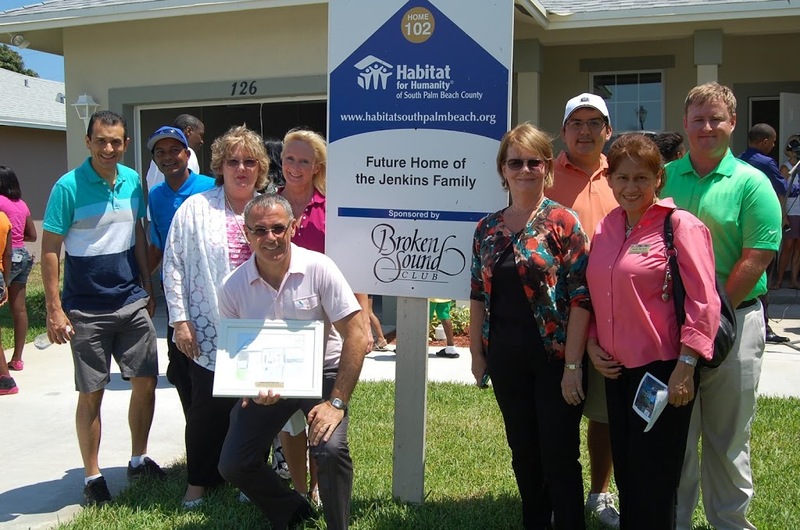 With the completion of both a one-story home in Delray Beach (in 2011) and this one-story Boynton Beach home, Broken Sound Club has donated $100,000 and 400 staff volunteer hours to the Habitat for Humanity South Palm Beach County Village in the spirit of one community making life better for another. Known for its signature blend of warmth, elegance and genuine hospitality, Broken Sound Club is an award-winning private gated golf and country club community that offers a choice of 27 intimate residential villages, each with its own character. Recently recognized as an Emerald Club and one of “America’s Healthiest Clubs”, the gated community’s natural beauty and lifestyle are enhanced by its strong commitment to the environment that has been designated as GEO Certified by the global Golf Environment Organization (as the first club in Florida and one of only 14 in the world) as well as Audubon Sanctuary Certified by Audubon International. For Rhonda Jenkins, owning her own home is a dream she’s been working toward for several years. A mother of two, Rhonda currently lives with her daughter Rashema, 24, and granddaughter Kei’jah, 4. The family has lived in Section 8 housing in Lake Worth for the past 10 years, where their two-bedroom, two-bathroom apartment is subsidized by the government. When Kei’jah joined the family in 2008, space became tight and Rashema and Kei’jah were forced to share a room. Despite living in Lake Worth, Rhonda met the Habitat For Humanity South Palm Beach County affiliate’s residency requirements because she has worked at Bethesda Memorial Hospital in Boynton Beach for the past 15 years. As a Unit Coordinator, she had plenty of experience with volunteers prior to ever stepping foot on a Habitat build site. Prior to applying to the Habitat for Humanity homeownership program, Rhonda worked closely with Credit Counselors of North America to improve her financial outlook. Her hard work paid off when she was accepted into the program as a prospective homeowner in October 2011. As Rhonda began her sweat equity hours, it became obvious that it was important to her to earn her home on her own. The affiliate’s sweat equity policy would have allowed Rhonda to recruit family and friends to contribute up to 40% of her sweat equity hours, but she resolved to earn them all herself. She credits her parents for her tremendous work ethic. Rhonda also used the sweat equity experience to become more active in the community, earning some of her hours at other local nonprofits, including the Caring Kitchen in Delray Beach. Although Rhonda suffered a hernia in December and wasn’t able to be as active on the worksite after undergoing surgery, she is determined to continue actively participating with Habitat in the future. 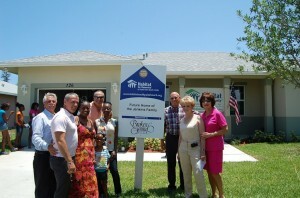 Campbell shared that after Broken Sound Club’s underwriting of its first Habitat For Humanity home in Delray Beach, Crean drafted and sent a letter inviting all other gated county club communities in Palm Beach County to share the importance and meaning of “paying it forward” via “community for community” sponsorship. Campbell noted that Crean’s letter generated the attention that resulted in the underwriting of three more homes by area country club communities. For more information on Broken Sound Club, its residential villages and club membership program, visit BrokenSoundClub.org or facebook.com/brokensoundliving or contact Maureen Schreiber, Director of Membership at (561) 241-6820 or Maureen_Schreiber@BrokenSoundClub.org. For more information on Habitat for Humanity of South Palm Beach County, headquartered at 181 SE 5th Avenue, Delray Beach, FL 33483, visit www.hfhboca.org, call 561-819-6070, or email info@hfhboca.org. Known as the “friendly” club for its signature blend of warmth, elegance and genuine hospitality, this award-winning private gated golf and country club community offers a choice of 27 lushly landscaped intimate residential villages, each with its own character. All are just minutes away from its main clubhouse with indoor and outdoor dining, two Audubon Sanctuary certified signature golf courses (one host to the PGA Champions Tour season opener), a new two-acre $6 million poolscape with bistro, a new $7 million 38,000-square-foot spa and fitness center, and 23 tennis courts. This 5-Star Platinum Club of America is conveniently close to two international airports, and just a few miles from the private Boca Raton Executive Airport, Boca’s burgeoning Class A office parks and vibrant Downtown, pristine beaches, A-rated public and award-winning private schools, two universities, sports arenas and stadiums, and an exciting world of shopping, dining, art and culture, recreation, and nightlife.